Family Volley: Parenting Books-LETS READ TOGETHER? You have probably answered this question zillions of times before, but what books on parenting and discipline do you recommend? Thanks so much! What a great question. Thank you. I have two immediate suggestions. Now, at first glance you might say, "This isn't about parenting or kids, or discipline". Oh, on the contrary, this book will change your life and your family's life. This book will help you become a better wife, mother, sister, and friend. When I started teaching 9 years ago I had to create my class from scratch. I was undecided about a lot of the curriculum except for this book. I knew that if I taught nothing else, if my students read nothing else and decided to tune me out every lecture, if I could get them to hear this, they would have the foundation for a successful family. We all know how college students are. They let you know if you have made them read something that was boring, unnecessary, or a waste of their time. I have taught this material to over 1500 students and never a complaint, not so much as one. In fact, they give me hugs, even the boys, thank me for making them read it and then buy 15 copies to give their families for Christmas. I read this book 5 times a year, and every time I learn something new. It can be read in a night, but takes an eternity to master. This book will. change. you. Please Believe Me. It doesn't matter what stage of life you are in, this is a must read. "Leadership and Self-deception" is very easy to get through, AND there are two more books that follow this one, equally as good. "Bonds That Make Us Free", and "The Anatomy of Peace". Has anyone read this book? I would love to hear what you thought and how it affected, affects you? 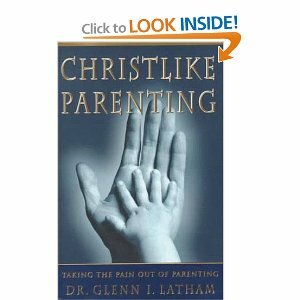 This book, along with "Leadership and Self-deception", really will take the pain out of parenting. Well, there will always be some pain, but boy do they alleviate a lot of it. It gives sound advice for dealing with temper tantrums to the teenage years. Your view of your children will change, and you will have greater respect for your role as a parent. This too can be read over and over, each time it will help refine the way you deal with your children. The ideas in this book are so simple but so powerful. They will change the atmosphere in your home. Things will be happier and more in control. Communication will increase and you will see the positive results you have been searching for. Christlike referes to Biblical Teachings. It doesn't matter your religion, you will love this book. Any of you read this one, what did you think? I would like to start a book club here on Family Volley, beginning with one of these two books. No rush to read them, we can take our time. I know we have a lot of other things going on in life. :) I would like to start discussions, have you share your insights, and all go through an enlightenment together. Anyone interested? Let me know which book you would like to read first, and we will go from there. Neither are very expensive which is always a plus, you can find them anywhere, online, or at your local bookstore, and they are both books you will want in your home always. So what do you say, should we start reading together? I would love to read with you. Both of these books sound amazing! My son will be 12 next month and I'm struggling with the transitions we are going thru as he's trying to 'spread his wings' so to speak. I appreciate the opportunity to learn from you! love the idea of an online book club! I would love to join in. We have had trouble with our daughter (4) in the past...enough so that we were considering going to counseling to learn different "tools" on how to deal with her. I would like to start with the first book, Leadership and Self-Deception. Count me in! I love to read! Heading to the library today so I'll look for them both! count me in as well! i'd love to start with either of these. I have already ordered the books! Thanks! I read Christlike parenting a few years ago and would love to read it again for a book club. I would read either for a book club. SO excited to have you all invovled. Let's take the next week or so and get our hands on "Leadership and Self-deception", we will start with that one. If you wouldn't mind, will you all send me your email address so that we can keep in touch (blog.familyvolley@gmail.com). Put FV Bookclub in the title. Remember, you can find both books online, your local library, any major bookstore. Let me know if you have any trouble. Also, maybe consider talking your significant other into reading with you. You will be glad they did. 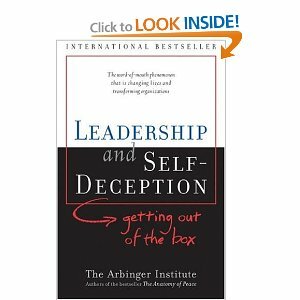 I have Leadership and Self-deception (read it for a college class years ago) and would love/need to read it again and join in on the discussion. Am I too late? I wanted to ask you about the Leadership book, does it matter if you get the 1st or 2nd edition??? Thanks for these resources. The only books I've really been wanting to get were the James Dobson books because I believe he has good things to say, but haven't really read anything as far as discipline or modeling the way for her goes and really want to since she's 13 months now and starting to understand things she's not supposed to do (but does them anyway)...like pushing the water spout on our water cooler. :) Anyway, sorry I wrote a novel! Just curious about the editions!